Herman Goering warns all Jews to leave Austria. Canadian election returns Mackenzie King as prime minister. 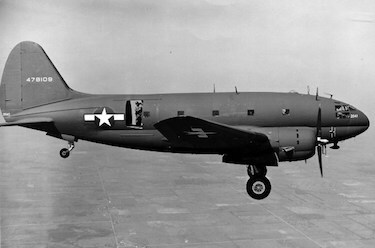 First flight of Curtiss C-46 Commando cargo plane in St. Louis MO. The British Cruiser York is severely damaged and then beached at Suda Bay in Crete, when it is hit by an Italian motor boat loaded with explosives. Two of the freighters from the recent relief convoy are sunk in port by the Luftwaffe. These two ships were still almost fully loaded as damage to the docks at Valletta has prevented their swift unloading. Of the 26,000 tons of supply that had been sent from Egypt on this latest convoy, only 5,000 tons were eventually unloaded. General Blamey becomes the Commander-in-Chief of Australian Military Forces. Churchill tells the conservatives, ‘It now seems very likely that we and our allies cannot lose this war, except through our own fault’. The Eighth Army wins the battle of the Mareth line, forcing the axis troops to retreat to the North. Koniev’s armies reach the River Pruth on a 50-miles front. The Russians recapture Kamenets-Podolsk. in the Ukraine. The U.S. Third Army reaches Main and establishes contact with U.S. Seventh Army on the East side of Rhine, near Worms. The US Third Army captures Darmstadt. The Russians take Papa and Devecser, both German strong points covering the approaches to the Austrian border. The ReichsfÃ¼hrer-SS is replaced by General Heinrici as Commander in Chief of Army Group Weichsel. The last organized Japanese troops on Iwo Jima make a suicide attack. Total U.S. killed on Iwo Jima is 6,891, with more than 20,000 Japanese being killed and only 216 captured. US Eighth Army lands on Cebu in Philippines. US Tenth Army lands on Kerama Islands 15 miles west of Okinawa to build artillery base; seizes 350 kamikaze torpedo boats.